You’re not alone. Heroes need a vacation, too. In Epic Resort, you’re building an ideal vacation resort that will attract heroes and tourists. Of course, if you’re attracting heroes, it’s likely that some monsters will attack your resort because, hey, monsters follow heroes, even on vacation. Mayhem will ensue and your heroes may help defend your resort, or they might opt to just be on vacation and leave you to do it. Tourists might get eaten and attractions might get destroyed. Just another fabulous vacation! Your job is to manage all this chaos, build the best resort, defend it from the monsters, and still make sure that your heroes get the rest they came for. If you can do that, you will have built a truly Epic Resort! 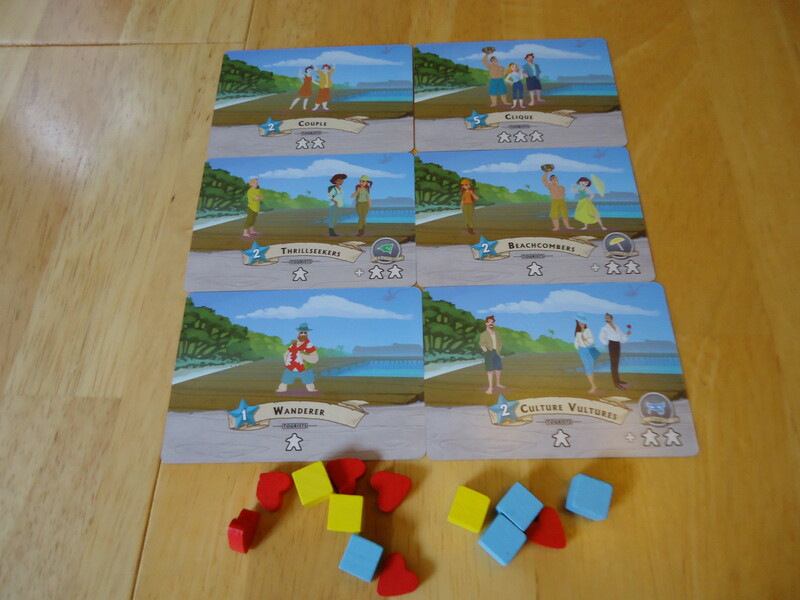 The goal of the game is to earn the most victory points by building and maintaining the best resort. To accomplish this, you need to staff and upgrade your resort, attract tourists and heroes, train and manage workers, and defend your resort against monster attacks. You’ll earn victory points for attracting heroes to your resort and giving them their much needed rest, as well as upgrading attractions. 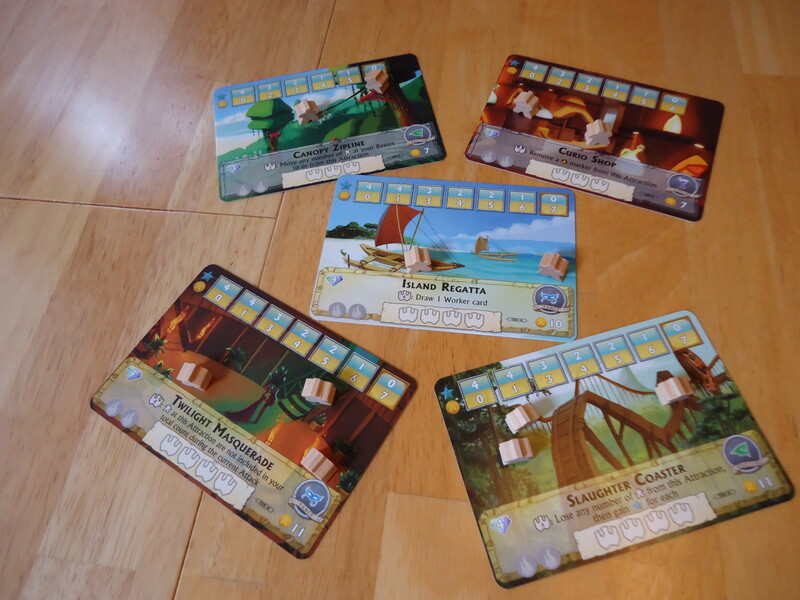 A game of Epic Resort is played over several “seasons,” each consisting of five phases. During Phase One, you’ll draw five workers from your worker draw pile and send them to work at your attractions. Unplayed workers are kept in your hand and their abilities may be used on your turn. If you don’t have enough workers on an attraction to match the units of work required to operate the attraction, tourists leave the attraction. Once any excess tourists are removed, you gain Flair and Gold according to the relevant numbers shown on the attraction. Every resort needs someone to do the labor. Phase Two is the action phase and the meat of the game. Players take turns performing actions until all players pass their turns. If you pass, you may not take any more actions, even if other players are sill performing actions. You may perform one Main Action per turn, or you can perform as many Free Actions as you want. Attract Tourists/Season Pass Holders. Tourists and pass holders are attracted by paying their cost and placing them on the appropriate attractions. Some tourists can go on any attraction and some can only go to specific types of attractions. Attract a Hero. Heroes are attracted by paying their cost and placing them onto attractions that do not currently have a hero. Some heroes have abilities that activate upon attraction and these must be resolved before moving on. Train a Skilled Worker. Skilled workers are trained by first removing the untrained worker card from your hand and paying the cost to add the matching skilled version of that worker to your hand. Newly trained workers can be added to an attraction to enable its ability. Purchase/Upgrade an Attraction. Attractions can be bought and upgraded by paying the associated cost. If upgrading, the upgrade must be of a higher tier than the base attraction. You may use the new attraction’s ability if enough workers are present. Pass Your Turn. This ends your involvement in this phase. Send Workers to Attractions. You may deploy any number of workers from your hand onto attractions. Use a Worker Discard Ability. If a worker has a discard ability, you may use it by discarding the card. A ship arrives at the dock during Phase Three, bringing more tourists, heroes, and, possibly, monsters. 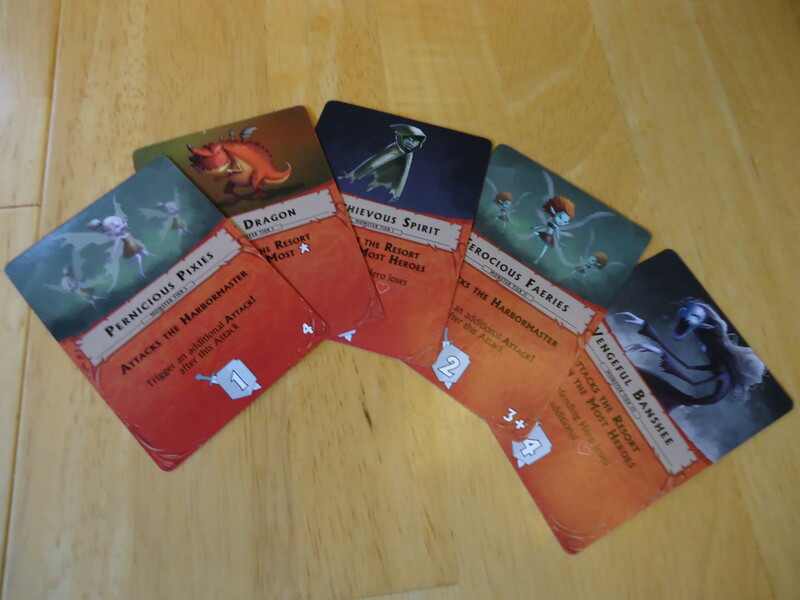 If an Attack card is revealed during this phase, monsters attack your attractions. You may move heroes to defend your attractions, have a hero already on the attraction do the defending, or move them to safety. Attractions may be destroyed or damaged during this phase, and heroes, tourists, and lazy workers may also be lost during the attacks. If the monster deck runs out during this phase, the game ends and you move directly to Phase Four and scoring. The heroes rest during Phase Four. Heroes with full health are moved to your scoring pile. Any remaining heroes receive one health point. Heroes who now have full health cannot score until the end of the next season, provided they keep their health up. Phase Five is the clean up phase and sets up another season, unless the game ended during Phase Three. All workers, used and unused are discarded. All locked abilities are unlocked and all players’ flair is reset to zero. Any remaining gold is carried over to the next season. Once the game ends, players calculate their scores. Add up the values of the heroes in your scoring pile and the values from all attractions. Each player also gains one point for each hero at an attraction. The player with the most points wins the game. Your resort is truly epic! Epic Vacation or TSA Nightmare? 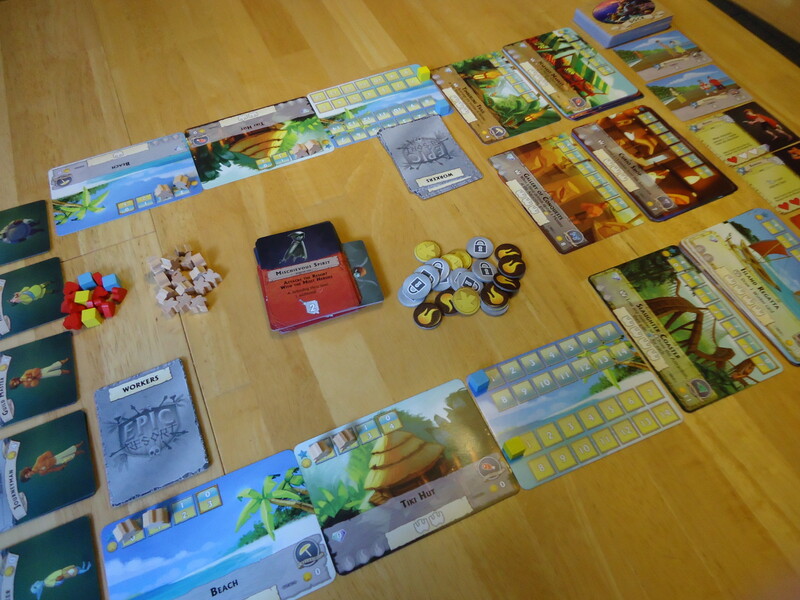 Epic Resort is basically a card game, although it is sometimes billed as worker placement and/or deck building. While Epic Resort does share some relation with these types of games, these are not the main mechanics. In reality, you are playing cards from your hand onto your tableau (resort) and trying to maximize your points. I only say this because if your expectations are for a pure deck builder or a pure worker placement game, then this game is likely going to disappoint you. On the surface, the game has everything that I should love. First, the theme, which is unique and right in our wheelhouse. We love games where you build and/or manage something. Suburbia, Subdivision, Asara, and the like are all favorites. The idea of building up and managing a vacation resort was irresistible and even brought to mind some games of “The Sims” with the vacation expansion added on. And the chance to build a functioning city of sorts and then toss in a touch of humor with monsters and fantasy heroes? Sign me up. The game also plays differently each time, which is another love of mine. 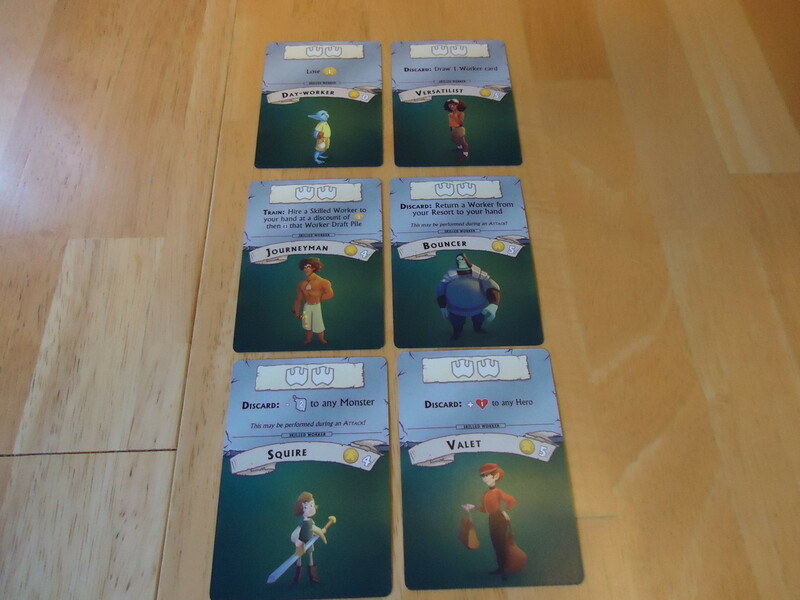 The cards come out differently with each game and you’ll find yourself playing with different attractions and heroes. Since each attraction and hero has their own special ability, no two games are going to be identical. The artwork is gorgeous. There is no denying that this game is eye candy, especially playing it in the middle of winter when all you want is a tropical vacation. The cards and attraction tiles evoke the theme with breezy, tropical images. The backs of the Dock cards, in particular, with their images of a resort at sunset really draw you into the theme. Another positive is that there is a lot to manage and it’s all very thematic. I love games where you have to juggle a lot of things to do well, and Epic Resort certainly offers that. You have to have flair to attract heroes, but if you have too many tourists, your flair drops because the heroes don’t want to go where it’s crowded. Yet tourists bring in gold which you need to pay for workers and upgrades. You have to keep enough workers at your attractions to keep them operating. You want your heroes to help defend you attractions from the monsters, but at the same time they need to get their rest in order to score victory points. You’ll find yourself sacrificing something to promote something else and you have to pay attention to everything. Unfortunately, despite all that I should have loved about the game, the actual gameplay fell a bit flat for me. It just never gelled into a smooth, effortless game. I think part of the problem is the rules. The iconography in the rules is a pain to sort through. Instead of writing out the words for “Tourist,” “Health,” “Flair,” etc. the writers chose to insert icons into the sentences. This makes it difficult to read and internalize the rules and requires multiple flip-backs to the icon chart. As a result, it’s harder to learn the game than it needs to be. There are also a few typos which slow down reading comprehension. Everything is presented in outline format, however, which does make it easier to go through everything step by step. But that’s also part of the problem. At times the game feels like you’re simply playing an outline. Gameplay never becomes smooth and internalized (at least it hasn’t for us after 10-plus plays). With lots of little rules, icons, tokens, and exceptions to be handled, you’re constantly referring to that outline to make sure you took care of everything. Just as you’re getting into the theme and enjoying building your resort, boom! Some niggling thing comes up and it’s back to the outline to figure out what comes next. We never felt like we could just relax into the game, which is a shame since it is vacation-themed. Worse, owing to the random nature of the draw deck, it’s possible for one player to get attacked over and over again. If they’re already in a weak position to defend against attacks, the relentless hammering can essentially end their game. And if that same person is also sitting to the left of the start player they can suffer more, as ties are broken by attacking clockwise beginning with the start player. This doesn’t happen often, but it’s not fun when it does. What vacation is complete without a few monsters? Finally, the winning strategy of this game is somewhat disappointing. Most games of this type encourage you to excel, at least in one category. Usually you want to have the most of something, be it money, residents, buildings, etc. In this game, you really want to aim for second best. Most of the monsters attack the player who has the most of something (gold, tourists, heroes) ensuring that anyone who is leading gets slapped down. This isn’t necessarily bad, as at least you can can try to adjust your strategy to avoid it. But it takes away the incentive to build a truly “epic” resort. You really want to hover closer to average and that’s disappointing in this type of game. If I’m playing a building game, I want to go big and this game punishes you for that. First-time players seem to enjoy this game the most. They love the sandbox feel of the game and don’t seem to care as much about winning or losing. The fun is just in trying to build the resort and seeing the new attractions and heroes come out. Once you’ve seen everything the game has to offer and worked out the best strategies, though, it loses its appeal and becomes more of an exercise in working through that outline I described above. That’s not bad if you don’t mind a more abstract exercise, but the fun of the theme drains away after a few plays. None of this means that Epic Resort a bad game. There are a lot of things to like about it. It does offer a lot to think about, wrapped up in a fun theme and gorgeous artwork. But it suffers from clunky rules, overly long playtime, and gameplay that becomes samey after a few plays. Despite my love for similar games, in the end this simply wasn’t the game for us. 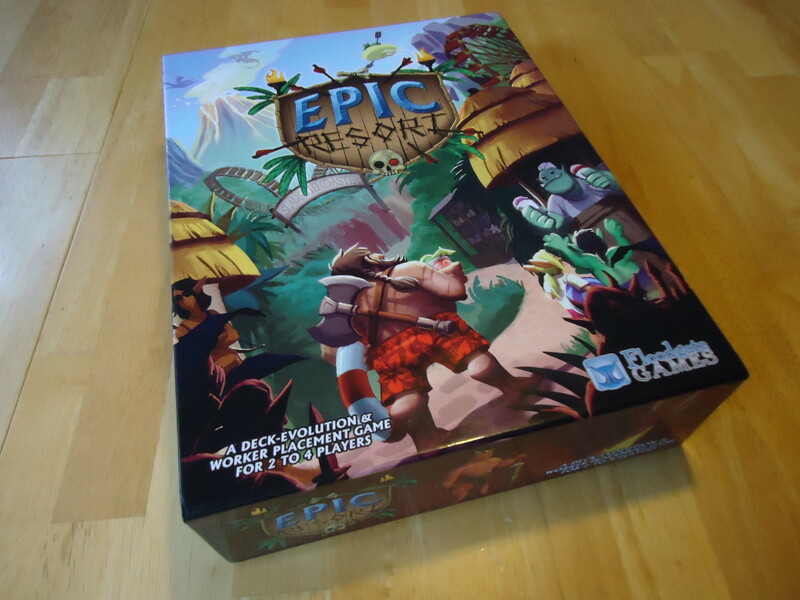 iSlaytheDragon would like to thank Floodgate Games for giving us a copy of Epic Resort for review. Great components and evocative artwork. Fun theme that appeals to lovers of fantasy games, as well as civ/city builders. Offers a lot to manage and the decisions all fit with the theme. Rules are fiddly and hard to read. Not much replay value. Becomes samey after a few plays. Does not reward excellence or "epicness" in resort building. Encourages you to dumb down your creation. I’ve played this a couple of times as a 2. The resolution phase reminds me of the Dungeon Lords phase where heroes invade player dungeons. The game centers around it, but it’s anticlimactic and procedural most of the time. In some situations, you may have some choice in which negative effect is applied to you. I already play that game every day. It’s called life.